Huge Savings Item! Save 16% on the Mouse Pad with Wrist Support and Keyboard Rest Pad - White Mousepad with Memory Foam Cushion for Palm & Carpal Tunnel - Ergonomic Support Set on Desktop, Laptop, Computer, Desk PC. by nOO1a at Kool Heads. MPN: K&M-FS-White. Hurry! Limited time offer. Offer valid only while supplies last. Keyboard Rest Pad & Mouse Pad With Wrist Support ENHANCE Yourself - More comfort. Less pain and strain. And who needs CTS (Carpal Tunnel Syndrome)? ENHANCE Yourself - More comfort. Less pain and strain. And who needs CTS (Carpal Tunnel Syndrome)? The use of a Wrist Rest reduces sprain and hand ache while you type. Do not rest your wrists on a hard surface. Placing your wrists on a corners greatly increases the pressure inside the carpal tunnel, causing it to become inflamed. This inflammation can lead to chronic pressure and pain on the median nerve, which provides feeling and movement to parts of the hand. Keyboard Rest Pad: Place your palms on the wrist rest to prevent your wrists from bending up and thus avoid uncommon feelings of numbness, cramping, pain, or tingling. Mouse Pad With Wrist Support: It facilitates more efficient navigation, prevents vibration. It improves wrist posture and reduces strain on the wrist nerves. Memory Foam: Provides extra support and comfort compared to other materials. 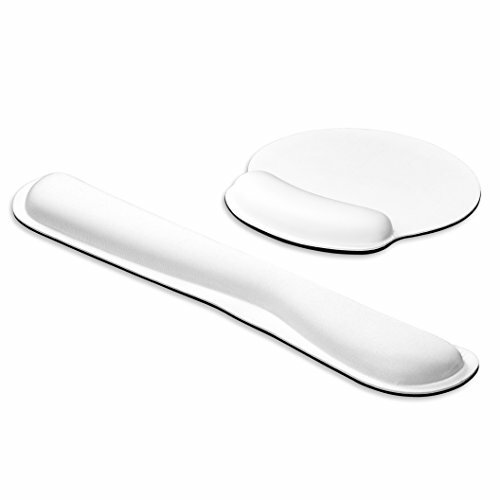 It is made from polyurethane combined with other elements which lend the pad its characteristic softness and density. Cotton Lycra: It's a mix of two materials, cotton and Lycra. Cotton is the well-known natural fiber and Lycra is an exceptionally stretchy, synthetic fiber with increased elasticity. Are You Using Ergonomics The Right Way? When resting, the heel of your palm, NOT YOUR WRIST, should be resting on the foam cushion. Even if you use wrist rests, you should still reduce the bending of wrists by adjusting other workstation components so that the wrist can maintain an in-line, neutral posture. Keep in mind that practicing good ergonomics can be a great preventative measure for avoiding issues like headaches, eyestrain, neck and back pain. Feel the DIFFERENCE - With a soft touch "Lycra" cover supported by memory foam padding to provide unmatched quality and comfort. Softness combined with ergonomics won't ever disappoint you. Professional-Level DESIGN - The Wave Keyboard Pad adapts to the natural curvature of the wrist, delivers protection through proper alignment, helps redistribute pressure points to provide soothing support and better circulation. Prevent SLIDING or SKIDDING - Using sleek non-skid rubber base helps keep the pads firmly in place offering maximum performance and stability. Eliminates Contact STRESS as you type - designed to support the slope of the keyboard in order to keep the wrist rested and naturally straight. NO LOGO OR COMMERCIAL BRANDING - makes mouse or keyboard padding visually clean, gentle and elegant on any table, in any environment. If you have any questions about this product by nOO1a, contact us by completing and submitting the form below. If you are looking for a specif part number, please include it with your message.